How Are Games & Gamers Changing the World? So…yeah. I’ll be busy. But that’s what I asked for. Load me up! I want my voice to be throaty and unrecognizable by Sunday! I want to be singing Johnny Cash! In the interim, I’m going to be giving a talk at APOGEE in Pilani, India, in case you’ll be in the neighborhood, and I’ll also be heading to Nacogdoches, Texas to give a talk at Stephen F. Austin State University (that’ll be March 3rd). If you’re nearby, I hope to see you! Otherwise, I’m on Twitter, etc. World’s a small place. Hey, guess what! Coming tomorrow, Game of Thrones season 4’s on DVD! And that means it’s just a couple of months until season 5! Eyelke jada! Update: My schedule for Norwescon has been updated. No panels have been deleted or added and no times have changed, but I did them with a 12 hour (a.k.a. normal) clock, added room numbers, and changed some of the panelists. As the title portends, I will be talking about Monty Python in this post, but first a brief commentary on “The Laws of Gods and Men”, written by old friend Bryan Cogman—who, by the way, is back on Twitter, so give him a follow! There were some great speeches in this episode, but I feel like Tyrion’s trial overshadows the awesome scene with Stannis, Davos and Tycho Nestoris at the Iron Bank. It’s really awkward and uncomfortable for Stannis, which is the point, but then Davos comes back with this incredible save out of nowhere. And while we don’t know what the outcome is precisely, we get the sense that he made a positive impression—which is made all the more powerful after you think about how Tycho has just gone over how they at the Iron Bank are swayed by nothing but numbers. Yes, Davos does give him some facts, but he also lays his heart out there in front of these stuffshirts—and it works. It’s a Hail Mary to end all Hail Marys, and I loved it. Whoa, hang on. Just realized I was about to write something spoilery. This is always a tough one. I’ve only read each book once, so when I start watching the show, I sometimes get confused about stuff that has happened or hasn’t—and whether it was in the books or the show. I had that confusion during the Theon scene, actually. Did that happen in the books? Also, from that scene, Ramsay was all cut up before that fight started, right? What was he doing beforehand?! That dude is straight up creepy; I love him. Oh, and another question: I missed the “red shirt” punchline that the girls shout. What is it? Zūgagon daor, ñuhys raqiros. Skoros ynot epilū? Yeng shijetra, osh eghlish. Tha shifang. Ye Thal poghash koth nyesha she yedhra. Or, hmm… Actually, I guess Dany never speaks AV, so I think this was a title Missandei already claimed, but still, it’s further cemented here. She’s the only actor who’s had to deal with all of the Game of Thrones languages, and for that, I salute her! And, in fact, if the White Walkers’ language and Asshai’i were not used in the show, as I suspect, she’s also the only actor to speak every language featured in the show. That is boss! Before leaving this episode, Tyrion’s trial was incredible (everyone knows that Tywin is my favorite character, so him doing anything is a treat), but I feel like the things I want to say about it are going to spoil at least one thing from the remaining four episodes… And since I’m liable to get confused, I’ll just hold off. All I’ll say for now is that I think Shae’s progression is done better in the show than it is in the books—either that, or I wasn’t paying close enough attention to the books. Frankly, it feels that way a lot when I’m watching the show (e.g. like the time I actually said, “Wait… Renly’s supposed to be gay?”). Also, “trial by combat” are possibly my three favorite words from Game of Thrones. If you’ve read this interview with me over at the Making Game of Thrones blog, you’ll know about yet another one of Dan Weiss’s practical jokes. The insults that the Meereenese champion was hurling at Daenerys et al. were translations of the French Taunter from Monty Python and the Holy Grail. If you don’t know what Monty Python and the Holy Grail is, you should probably stop reading this blog and find a way to watch the movie immediately. At the very least, you can see the speech being referenced here. Also, I know I mentioned this in the interview (which, by the way, D&D gave their blessing to), but just to be clear, I don’t get credit for coming up with this idea; that was all Dan Weiss. Usually after I’m done translating the bulk of the material for a season, Dan gets an idea for something fun after the fact, and I get an e-mail starting with something like, “Hey, I had an idea for a joke…” I know I’m generally a stickler for realism when it comes to the languages, but when this opportunity presented itself, it was just too good. I like to think (though I don’t know either way) that Emilia Clarke, Nathalie Emmanuel, et al. had no idea what the champion was actually saying. This would amuse me to no end. But anyway, if you’re wondering, “Does this mean there are hamsters in Essos?”, or “Does this mean there were elderberries in Valyria?”, I honestly have no idea. I had to Wikipedia “elderberry”—both when I coined the word, and just right now again, because that’s how much I know about elderberries. The relevant words lie somewhere in between the holy mountain of Canon and the dry wastelands of Non-Canon. I’ll not sort it out beyond that. Byjan vavi demble eva o, trezy eme verdje espo jimi! Oa mysa iles me nýnyghi, si oa kiba tuziles espo tomistos! So you don’t have to look for it, “hamster” is nýnyghi (which may have been inspired by the Knights who say Ni). Also, tomisto, from High Valyrian tōmītsos, was an homage to my friend Tom (a.k.a. Tommy) Lieber. I’ve found a way to work him into each one of my languages, but “elderberry” is the best, I think. Já si hojgá oa gundja, trezy eme mero dovodedha! Note to the Wiki folks: If it’s got a j in an odd place, it’s probably Ghiscari in origin. Kiman nya másina orvorta va oi sodjistos! Do eban av kimívagho dombo, o doru-borto pame espo gruzi evi havor espo begistos! Ghorgan ji pungo va o, nynta Dare espo Zaldrizes, o si une oi dovodedhi, Vesterozi azzzzzantys. But let me apologize to the Valyrian students out there. In the interview, I said that I didn’t think anyone had figured it out, but I sold you short! Mad Latinist and at least one other person did guess right; I guess I just didn’t hear about it (probably because I was traveling at the time). Well played! And you didn’t even have the words for “hamster”, “elderberry”, “aunty” or “fart”… That’s excellent sleuthsmanship! So back when I announced the annual Dothraki haiku contest, I thought it would be fun to see if anyone could do something with High Valyrian. Then this thing basically became all about High Valyrian. Yikes! All right, so let’s deal with that first. Since Japanese originally used mora counting for its haiku, I thought it would be cool to do that for High Valyrian, since it also had long and short vowels. Clearly I did not think this through. High Valyrian words are way too big for a haiku. The form just doesn’t make sense. If anything, one should only pay attention to syllables. That might make haiku possible for High Valyrian; it just makes the practice a little less interesting. Haiku seem to work very well for Dothraki, but it’s just not going to work for High Valyrian. In discussing this with my wife, she had an idea: What about limericks? Kind of sillier, but I think it could work, because three of the lines are usually quite longer. I think of the classic limerick as being 9-9-5-5-9 (syllable count) with an AABBA rhyme scheme. However true limericks often will have more syllables than that (or fewer, as the case may be), which I think would suit High Valyrian quite well. So this is what I want to try. Those who were trying to do High Valyrian haiku, try a limerick. Give it an AABBA rhyme scheme and try to make the B lines shorter, but there will be no strict syllable counts. We all know what limericks sound like, so you should try to make it sound like that. Use the heavy syllables to your advantage. If you want, you can have long vowels count for more than one syllable, if it makes sense in your schema, but you’ll be in charge of coming up with that schema (the poem itself will, essentially, argue for a meter). Anyway, once you’ve tried it out, if you think it’s doable, I’ll announce a separate High Valyrian limerick contest at some point in time later on. You’ll have more time than the Dothraki haiku contest, since the form is longer and a bit more complicated. Let me know what you think in the comments. 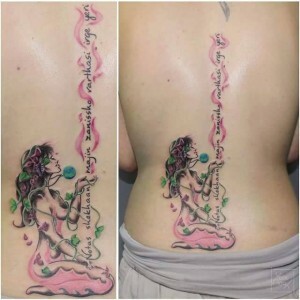 The intended meaning is “Smoke and ash will come with the winds”. Very elegant! I like the use of the coordination strategy to stretch out the second line (i.e. lengthening the last vowel of ñuqir). Very well done! Technically it should be jelmȳssi, but that doesn’t change the mora count. Also the second line is one mora short if you discount codas. If you count the final r of ōrbar, though, it works, so I will count it. I like it! This is probably my favorite High Valyrian offering of the bunch. That is “Valyria fell before, but the sun continues to rise”. That’s the literal translation. Discounting final consonants, that does work. Nice job! In the comments, Mad Latinist suggested that it should be ropetas? It should not: ropatas is correct. This is because the stem is ropa-, not rop-. Easy mistake to make, though. Honorary mentions go out to Zhalio and Joel W who tried to translate the Pater Noster, despite lacking most of the necessary words! You can see Zhalio’s translation here, and Joel W’s translation here. I don’t have time to review them, but will look into coining some of that vocabulary. He didn’t attempt a fluent English translation, but I will: “Dragons and that woman I sing, from Essos sent / First through Pentos, then the Dothraki sea, by the hand of fate…” Sounds awesome. Sounds like something that should be attempted after the series has completed (I promise High Valyrian will have enough words to handle it at that point). It’d require GRRM to sign off on it, but wouldn’t that be awesome? After all, all the old myths are told and retold; they’re not made up whole cloth. Daenerys would be an outstanding subject for an epic poem (or I’m assuming. I too don’t know how it ends). You can hear Mad Latinist’s friend pronounce it here (good reading!). If there is one quibble I’d have, it’s with ivāedan. Since the oblique applicative is being used, it should be standing in for some sort of adpositional phrase which is appropriate to the oblique applicative. Unfortunately if you want to say something “about” something, the postposition you’d use is bē, which is technically a locative postposition, so it should probably be uvāedan (and the cases would have to change accordingly). But maybe you could get away with ivāedan. Okay, enough Valyrian. On to the Dothraki! The intended meaning is, “She is beautiful, wind blew on her hair, she is a good horse”. Of course, “she” is just a translation choice; it could be “he” or “she” in Dothraki. There are a couple of things that need fixing. First, zheanalat is the infinitive; it should be zheanae. Next, the possessor comes after the thing it possesses, so it would be noreth mae, but also since “hair” is inalienably possessed, it should be moon, or just not expressed. I might also have used vi instead of she for “through her hair”. So it would be Chaf hol vi norethaan, which would indeed be seven syllables. It’s debatable, though. She is supposed to serve as the locative preposition that “makes sense”, so it could work here. In the last line, it should be hrazef davra (noun-adjective word order), but otherwise this is pretty good! I like it! I think the intended meaning is “Trying to turn a great piece of writing into a great language is hair being pulled”. I’ll give you an A for effort here, The Majesty, but this doesn’t really work. Neither kis nor notat can be used in that way. But you did get the message across! Yeah, I gave up on trying to translate the prologue for the first book after sentence one. A good translation of this is “The stallion is stronger, but my hair has more bells in it”. A nice one! Two things are standing in the way of this one being great, though. The first is that “hair” is inalienably possessed, so it should be noreth anhoon. That’d put it one syllable over, but you could do vosm’mra (it is poetry, after all). Second, adjectives follow nouns, so it should be ayena ale. I could see how you’d get a determiner reading for this, though. If you were to put it in front, I would say it has to be ale ayeni—maybe alikh ayeni, “a surplus of bells”. The content is terrific, though, and I really like the use of mra here as “have”. Ordinarily it’s just mra qora which is kind of used as “to have”, but it makes sense to use it with noreth here. Great job! Now we move to Qvaak. 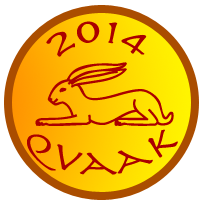 This year Qvaak did a cycle of poems switching between High Valyrian and Dothraki. It was a bold attempt! You can see the whole thing here. I’ll only discuss the two Dothraki haiku here. My translation is, “In the forest, hair clings to one’s face: a gift of the spiders.” My only complaint is with the punctuation: I would’ve used a colon rather than a semi-colon. Otherwise, this is good Dothraki! Excellent choice of adding the inchoative -o suffix to fenat (an invention of Qvaak’s; wholly appropriate). I might also have said azho qosaroon, given where it comes from. Otherwise, very good—and certainly a feeling we all know, if you’ve ever run into a spiderweb. My translation is “The treasure of the wastes is the bones of men whom it has devoured.” Qvaak translated this as “desert”, but there actually is a Dothraki word for “desert”: zelatha (inanimate, Class A). I think it’s also the mark of a good poem when the translation doesn’t do the original justice, and I think that is the case with this poem. I like that on account of the relative clause the subject is forced to go last. Gives it kind of a stinger at the end. Also, if you wanted to switch to “desert”, it’d be an easy fix: Just change it to masar zelathi. I like it the way it is, though. Very nice! And, yes, this means that, three years running, the Mawizzi Virzeth goes to the evidently unbeatable Qvaak. You’re a machine, Qvaak! A soulful, artistic machine. Hajas, zhey Qvaak! Thank you to all who submitted haikus this year, and thank you to all those who ventured into Valyrian territory. Let me know what you think about my idea and we’ll see about starting up another competition. A different option might be two do a hexametrical couplet like Mad Latinist did, but I thought this might be too difficult. Thoughts? I’m open to either. Mad Latinist’s was outstanding. Well, it’s that time again. It’s been another year, and now I’m thirty-three. It’s been a heck of a year. I presented at TED and El Ser Creativo, did a really epic season of Game of Thrones that got totally shafted by the Golden Globes, the first season of Defiance, Thor: The Dark World, and picked up a couple new projects. What I didn’t do was get to 4,000 Dothraki words. Things have really slowed down on that front. Having a bunch of stuff to work on is outstanding, but it does mean that I’m not able to expand the languages as much as I’d like to, or give them as much attention as I’d like to. I haven’t forgotten about anything, I can assure you, it’s just going to take more time for me to get things settled. Consequently, there’s not a lot of new material to work with for this year’s Dothraki haiku competition—which begins right now! I’ve thought a lot about expanding to include Valyrian, so here’s what I’ll say. I will allow Valyrian haiku, but they won’t compete directly with the Dothraki haiku. If there are a sufficient number of submissions, I’ll make Valyrian a permanent member of the haiku competition. For now, though, Valyrian is an expansion language, and Valyrian compositions will not be accepted for the coveted Mawizzi Virzeth. Okay, that should be figure-out-able, but I won’t lie: it’s a little tricky. This year’s challenge word is noreth, “hair”. Because I like it. Again, the challenge word is not required, but if you wanted something to give you a jump start (in case you can’t think of a theme ex nihilo), try using the challenge word. It’s got kind of a strange shape (and was likely inspired by the Moro word ndreth, which is the plural of ereth, which means “clothes”). For the purposes of this contest, a haiku is 17 syllables long, with the syllable counts for each line being 5, 7 and 5, in that order. If you need to fudge, we’ll set up a separate category for haiku that are 17 syllables, but maybe don’t hit the right line numbers. For Valyrian: Long vowels count as two mora, and a vowel with a coda counts as two mora, but a syllable will not have more than two mora. So a long vowel plus a coda consonant will still be two mora, for the purposes of the poem. Try doing this with mora, instead of syllables, and see how it goes. This will make it more like a real Japanese haiku. If you need a particular word in a particular number/case combination or a verb in a particular conjugation, please let me know and I’ll give it to you. I’ve returned from SpaceCityCon, and had a bit to settle in here, so it’s time to start the year in Essosian conlanging. 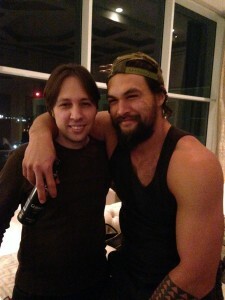 But first, I got a couple pictures of me with Jason Momoa (one below), who is, of course, awesome. The guy just absolutely loves life and is a ton of fun to be around—and he’s nice. He’s a good guy. If you get a chance, you should check out Road to Paloma, which he’s directing and starring in coming out this year (trailer here. On my last blog post I got a request to translate “To boldly go where no man has gone before”—the old Star Trek slogan (the new one, of course, being “where no one has gone before”)—into High Valyrian. Seems like an odd pairing, but it is somewhat amusing for linguistic reasons. The whole “don’t split an infinitive” thing is one of those false rules that gets handed down from teacher to teacher, and the Star Trek motto is always held up as either an egregious example of the miscarriage of grammatical justice or as evidence that you can, in fact, split an infinitive. It is, of course, an example of the latter, with the whole “splitting infinitive” thing coming from the fact that you can’t “split” an infinitive in Latin, since it’s a single word. And Latin, of course, was George R. R. Martin’s inspiration for High Valyrian, in which you can also not split an infinitive, since it’s a single word. Consequently the translation won’t feature the same split that English does. Anyway, there were a couple of attempts to translate the phrase in the comments, but it’s missing some key vocabulary, so let me go through and do this, since it seems like fun. Let’s start with the easy part. The “to go” part is going to be jagon, and it’ll be the last word in the sentence, so we can file that away and focus on the rest. There is no subject, which is handy, so let’s deal with the first modifier on jagon, which is “boldly”. In English, “bold” is pretty much a gentlemanly word for “brave”, so let’s stick with “brave”, which is nēdenka, in the nominative lunar singular (it’s an adjective). To turn that it into an adverb, you have to know the adjective class. Nēdenka is a Class I adjective, which means that it takes a suffix -irī to become an adverb. Thus we can change nēdenka to nēdenkirī and get nēdenkirī jagon. We can pop that bad boy at the end of the sentence and we’ve got the business part of the sentence done. Now for the troublesome bit: Where no man has gone before. Again, let’s start with the easiest part. Since this is for a tattoo, I want to give you the option of saying “no man” or “no one”. This is a new clause of which the subject is “no man”, so we know that phrase will be in the nominative. To say no one, you’d say daorys, and that concludes that. To say “no man” specifically, you’d say dōre vala, but if you’d like to have a prolix gender neutral expression, you could say dōre issaros, which would be “no being”. Whichever one you like, though, you’re now done, because their citation forms happen to be the forms that are necessary for the function the “no man” bit plays in the clause. For the verb, you’d use the perfect. In Low Valyrian you might use a different construction for “has gone” as opposed to “went”, but in High Valyrian the two are conflated. The form of the verb is istas, so the phrase becomes daorys istas (or dōre issaros istas or dōre vala istas), which is “no one went” or “no one has gone”. Before getting to the clause-linking part, Mad Latinist conjectured that you might be able to use naejot to mean “before”, but Zhalio noted that this was unlikely, given its etymology. In this case, Zhalio was correct. You can use naejot to mean “before” for the meaning “in front of”, but you can’t use it for the temporal “before”. For that, in fact, you use gō. You might remember gō from such meanings as “underneath” and “below”. It also means “before” in the temporal sense. This is a part of a guiding metaphor High Valyrian employs where height is associated with time depth. Consequently, things that happen before the present are below the present, and things that happen after the present happen above it (tolī as an adverb or toliot as a postposition). The postposition gō can be used as a postposition or as an adverb (just as with naejot), and so the expression now has become daorys gō istas. Skoriot istas ūndan. “I saw where he went. Istas luon lenton ūndan. “I saw the house where he went. I know [who wrote Catch-22]. I know [the guy [who wrote Catch-22] ]. Hoping this makes sense. Consequently it’s not really a relative clause. Rather it’s a self-contained clause that is the object (or topic) of the matrix verb. Skoriot daorys gō istas nēdenkirī jagon. I suppose if you did want to mimic the so-called infinitive split, you could put nēdenkirī in the front (something like “Boldly where no one has gone before to go”), but I wouldn’t recommend it. And, of course, you can substitute dōre vala or dōre issaros for daorys if you so choose. So there you go, Monserrat Vargas! If you get a tattoo, please send us a picture. Also, a couple general notes. I’ll have a big announcement later this month, but I did want to note that this year I’ll be working on the show Dominion on Syfy. No major info on that yet, but I’m working on an a posteriori language for the show (my first, though not as stringently a posteriori as a language like Brithenig or Wenedyk). It’s called Lishepus. Otherwise, happy new year! Stay tuned for the yearly Dothraki Haiku Competition. It’s coming! A while back, frequent commenter Esploranto mentioned that it would be nice if some of the posts on the Dothraki blog could be translated into Spanish. I agreed, but didn’t feel up to the task (my writing style is too idiomatic and idiosyncratic for my Spanish to handle! ), so Esploranto offerred to give it a go. He translated a couple of the early blog posts before I realized that there was no simple way to host translations. What would be perfect is if there was a button that you could click on to easily switch between the English and Spanish translations of a given blog post. Anyway, to see it in action, you can go to my very first post and see the translation provided by Esploranto, upon whom I have conferred the Dothraki name Najahho: the victorious one. Kirimvose, zhey Najahho! Of course, there’s no reason that the Dothraki blog need be translated only into Spanish. Any and all translations are welcome—including conlang translations! It’s pretty easy to add a language to the plugin, so I can expand the list to include whatever I want. If you’d like to translate a Dothraki blog post, just send the translation in a plain text e-mail to me (or attach a .txt file). If possible, please keep the HTML in tact (it will simplify my job greatly). Provided it looks okay, I can just paste it right in and we’ll be set! Oh, but do include the phrase “Translated by [your name]” in your language to append to the end, and if you’d like me to link to your website, include a link for me and I’ll add it. Just one note before leaving the topic: Right now the plugin has one kink in it which has broken the right-hand navigation slightly. All the options are there, but they’re not as neat as they were. Ian’s working on a fix, and when we get it, we’ll be sailing. If it’s morning where you are when you’re reading this, it means that I’m on a plane headed to Seattle for NorWesCon. Can’t wait! If you’re in the Seattle area, come give me a shout. Otherwise…three days. Tick tock.